Ligonier has made Sproul’s 10-part series on the atonement available as free downloads. The motivation is the growing number of “evangelicals” who are questioning the doctrine of substitutionary atonement. This series will ground you in the bible’s solid ground of the atonement of Christ. Mark Dever spoke at the dorm of Boyce College on the subject of Conversion and Evangelism. The Master’s Seminary Faculty Lecture series for 2009 looks at penal substitution, which is under heavy attack in some corners of “Christianity”. TMS is known for very thorough academic level work, and these messages will be published in the TMS Journal soon. Because of recent attacks on this crucial doctrine, we believe this will be one of the most important issues that the journal has ever published. 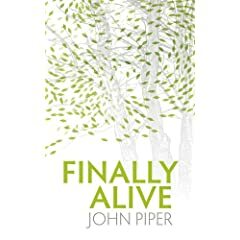 Last year John Piper published the book ‘Finally Alive’. This book was spawned by a 16 part message series he preached in 2007 titled ‘You Must Be Born Again’. This is a marvelous book and series that looks closely at conversion, the new birth, what it is, what man does in it, and what it produces in man. This is a very good series and certainly worthy to have in book form.